Nelaguli is among the villages in Nettigere gram panchayat limits selected under Saansad Adarsh Gram Yojana (SAGY) in the first phase of the scheme. NELAGULI, BENGALURU: The main junction of Nelaguli village, off Kanakapura Main Road, is host to a large sacred fig tree and two idols. From here, all the four corners of the village are visible, showing open drains and other features reminiscent of any other village. Nelaguli is among the villages in Nettigere gram panchayat limits selected under Saansad Adarsh Gram Yojana (SAGY) in the first phase of the scheme by Union Minister for Statistics and Programme Implementation DV Sadananda Gowda. During a reality check by The New Indian Express, villagers were unhappy about the progress made under the scheme. 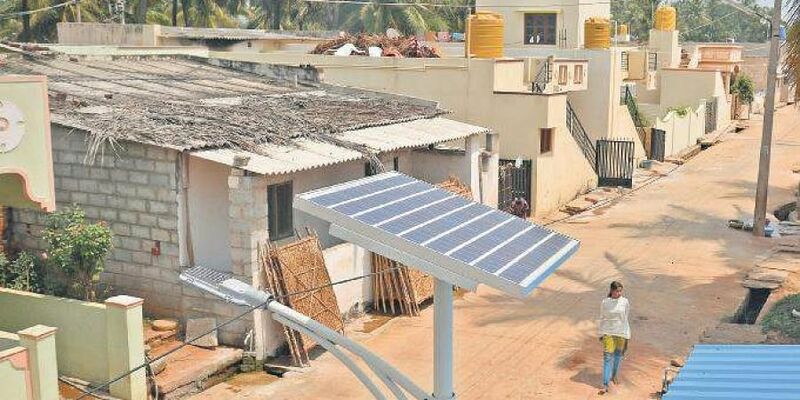 “Save for 20 solar lights, a 900 metre stretch of road and one overheard tank, no other infrastructure development project has reached the village,” according to Shanta Shashi Kumar, member of Nettigere Grama Panchayat and one of the three members from Nelaguli. Even the benefits of the overhead tank reached late as there was no transformer to provide power supply for the motor which pumps water into the tank. There were several demands placed by the residents of the gram panchayat when the scheme was inaugurated with fanfare. “But, almost four years after the scheme was launched, there is neither an ATM nor a bank branch here. Our demand for a veterinary hospital, since most of the farmers practice animal husbandry here, too has remained unfulfilled. Apart from it, connectivity from the village and a dedicated health facility in the form of a visiting doctor is also not present,” Shanta said. When contacted, Sadananda Gowda’s office maintained that several developmental activities were carried under SAGY in the village and was even appreciated by the Union government.